A container garden is not so different from a regular garden – it’s just above ground. If you want to grow your own food and your space is limited, container gardening might be the perfect way to go because it gives you more control and a lot can be grown in a small amount of space. The containers themselves are beautiful, though what is more lovely than the meals you’ll prepare with the food you grew yourself? Why use containers to garden? Container gardens are efficient and you can produce high yields in small areas. The food can be healthier, especially if you set up organic container gardening. As far a gardening goes, it is also incredibly convenient. You can even do indoor container gardening, a blessing for those without any outdoor real estate. You’ll save money on your groceries too! Just think how much you’ll save if you grow your own herbs with herb container gardening. Fresh herbs are expensive. Finally, container gardening gets you active- gardening is proven as a form of exercise. While coming up with container garden ideas, it is important to consider the climate you live in. Not every plant will thrive in any area. As you learn how to grow your own food, you’ll get better at knowing what works in your location. Ask around at your local nursery for some ideas. There isn’t much else that limits your choices, though. 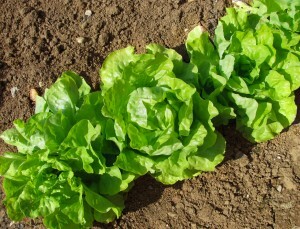 Plants that work well in a 5 gallon window box, for example, are beans, carrots, lettuce, spinach, radishes and onions. As with all gardening, the soil is the key to success. Water needs to drain well so be sure the soil is high quality and the container has drainage holes. Container gardening supplies are not so different from regular gardening supplies. You’ll still need tomato cages for your tomato container garden, for instance. Of course, it is the containers themselves that stand out. Wood container gardens are terrific, especially for raised container gardens, but you’ll want to use cedar so it won’t rot. Whatever style or size containers, you should be sure they have plenty of drainage holes that are approximately one half inch wide. The size and shape of the container should match the purpose as well. For example, strawberry container gardening require more space than a raspberry bush container. 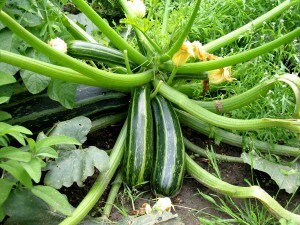 Growing your own food with fruit and vegetable container gardening can be extremely rewarding. The container gardening vegetables and fruits that you grow will taste better than anything you can buy at the store. Whether you are doing a large backyard garden with containers, or just a bit of modest patio container gardening, you’ll find that this method of gardening allows you ample control to grow your own food profitably and well. 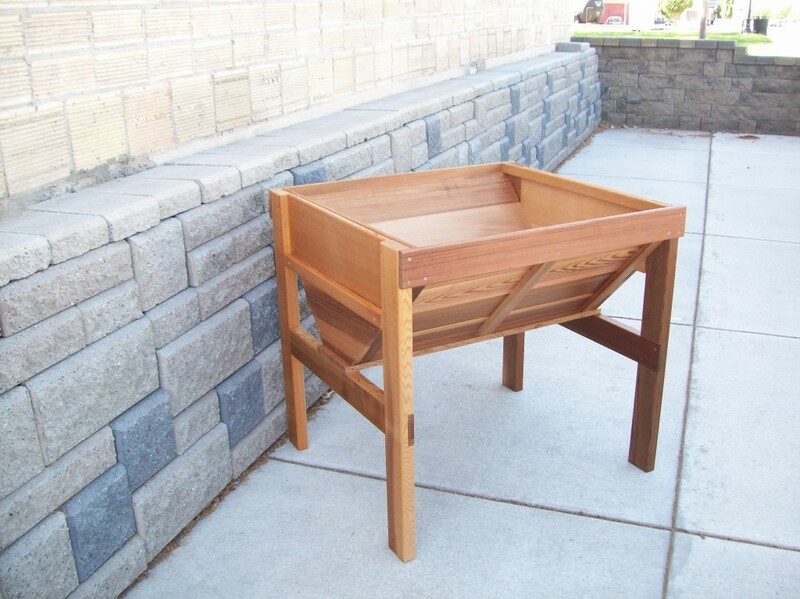 Wood Country’s handcrafted Raised Vegetable Garden Bin is now 5% OFF! For the month of April, save 5% when you order our beautiful cedar bins and then you can get gardening! Hello, I’m the hardgoods buyer for Al’s Garden Centers in Oregon. I’m interested in your raised vegetable garden bins. Can you provide information (price, availability, any distributors) so we could possibly stock your items? I can email you a price list and delivery schedule for your area if you are interested. We come to Oregon once a month for our deliveries. The raised vegetable wholesales for $83. Let me know if you are interested. As wood country is our retail site, you might know us by T&L Cedar Lawn Furniture. We have sold to Al’s in the past. I purchased a Wood Country Cedar wood vegetable planter box and am having difficulty putting it together. I have followed the instructions and have glued the legs and the cross beam together. I have then screwed the 1 1/4in screws in the pre-drilled holes. Unfortunately, some of the screws are not biting into the wood. Please let me know what I can do to allow for a sturdy product. We can send you some longer screws to replace the shorter ones. That should solve the problem. Send me your name and address and I will get these out right away.